Good morning class. Welcome to round four of Alphabe-Thursday! And remember.... link back to this post, you need to be registered as a follower of my blog, PG posts only, and visit at least 10 other students (perhaps the 5 students before and after your post). The links will stay live after the final post deadline has passed so you can even wait and visit over the weekend or whenever you have more time. 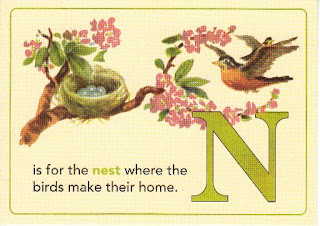 Please share your nifty "N" post now! I hope you had a great week! Thanks again for hosting our Alphabe-Thursday party. NOTHING NUTTY today. Just want to say there was NEVER a NICER time for a NIFTY Alphabet N celebration! Hope you have the nicest N day sweetie. You are a very good, and stern! school teacher. I read N is for Nails and came over here to say hi. Hello Miss Jenny & fellow classmates. I entered the linky late last night & forgot to enter my comment, so here I am. I'll start my visits later & over the weekend. Have a great week everyone! Thanks so much for hosting each week. I love your parties and I love trying to come up with a name for my post to fit the letter of the week. Very fun!! Oh Jenny here I am late again, this week has been taking up a beast of my free time! I do hate posting so late and actually didn't last week just because being so far down upon the bottom feels like I'll never catch up...but off I go to try! Why can't I ever be at the top? I tell you why? It's because I'm nutty! I can't ever think of what I want to write about until the night before while laying in bed. I keep saying, "This is notta-gonna happen any more." and then it does. Next time, I'll try NOT to slip up by being so late for class. :( Thanks, Miss Jenny! N almost made me nutty, but I finally came up with something. Hi Jenny, came here from a friend's blog. I might join your meme next week..
Saturday Centus - Safety in location!